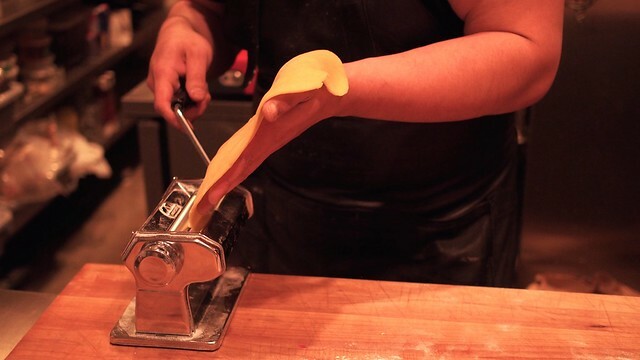 Pasta making and tasting inside Nicli's Next Door's kitchen in Gastown on December 8, 2014. Nicli Antica Pizzeria's aptly named sister restaurant next door has quietly built up its reputation as a kitschy yet sophisticated ristorante in its own right. 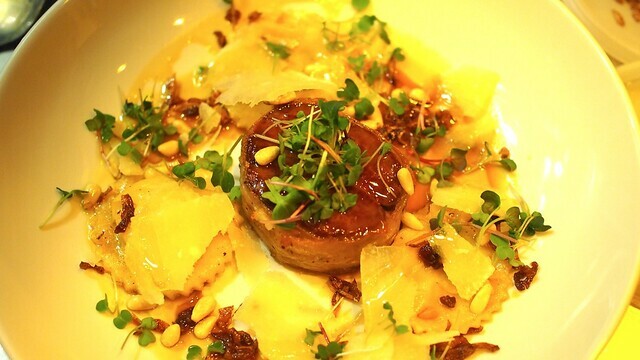 Nicli's Next Door is a stylish and authentic Italian eatery with a cool, casual vibe, drowned under the stark yellow lights, while the kitchen focuses on small bites (think Italian tapas), meats/cheeses, and array of pastas. 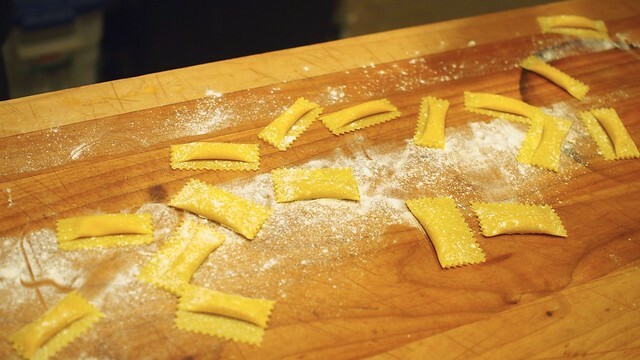 Nicli's is one of a handful of local restaurants to make their own pastas fresh and in-house. 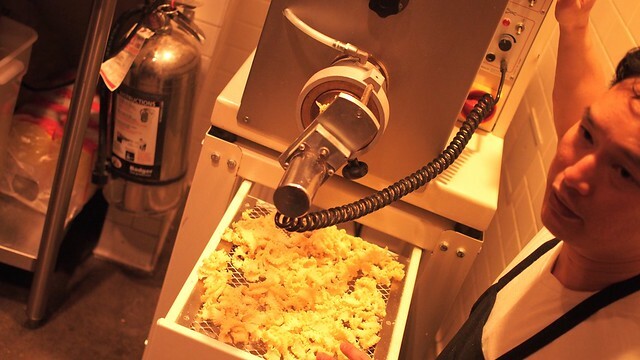 Chef Keev Mah (above) demonstrated their pasta making machine and by-hand methods inside the kitchen. The bites feature a nice assortment of well-prepared ingredients. 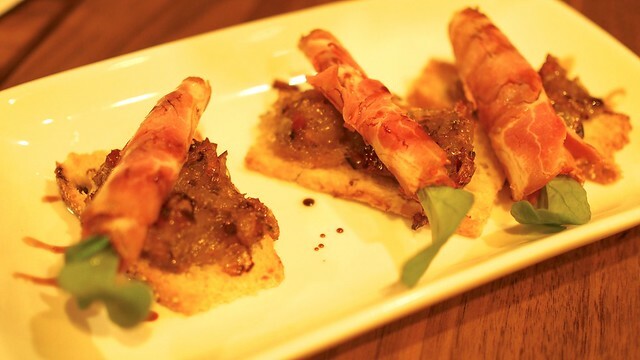 The delectable bruschetta (topped with bacon and leek jam, rolled in capicollo and arugula) comes in threes and makes for a delicious trio. 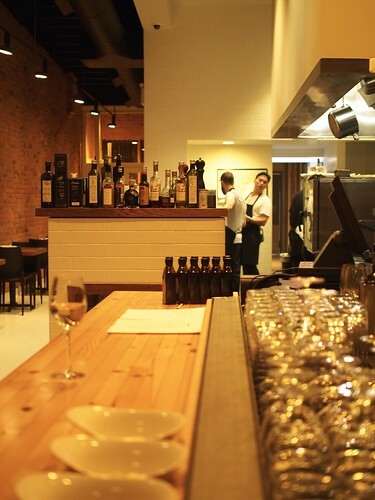 The open kitchen adds to aura and dining feel with the establishment making most of their dishes from scratch. There's also a certain level of culinary innovation and experimentation coming from the kitchen. 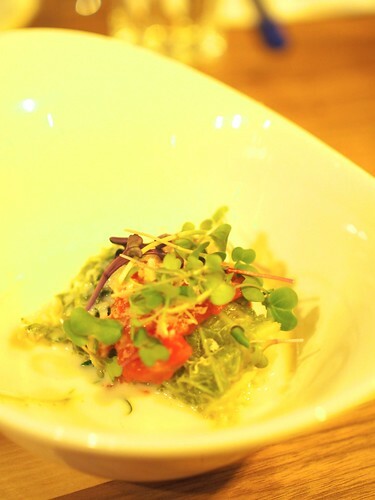 I was intrigued by the mishmash of tastes in many of the dishes, especially the savoy cabbage involtini (with venison, porchetta, and burrata rose sauce, photo by Joann Pai). It's emblematic of the diverse flavours and Italian influences inside and out. 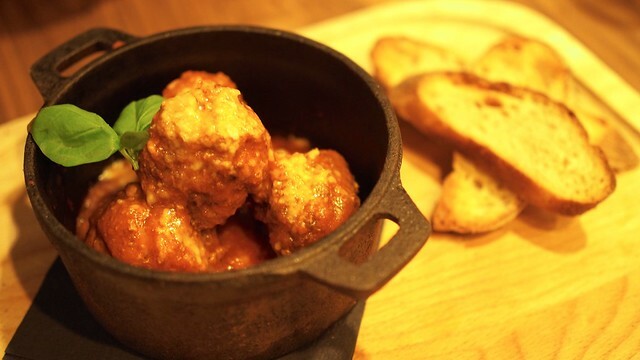 My highlight (shared by many guests) was the simple but mightily satisfying meatballs (in San Marzano tomato sauce) full of rich, meaty flavours. Another standout was the dynamite tasting triple-cooked fries (with 18-month parma prosciutto, arugula, and aged parmesan gravy). 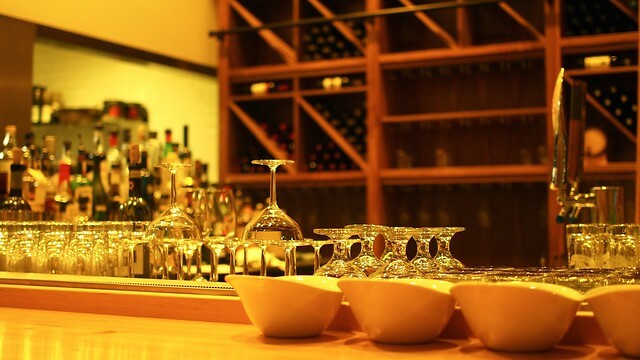 Nicli's Next Door has a very casual, easy atmosphere contrasted with its detailed approach to the food and drink served. After our tasting, Chef Josh Gale demonstrated for us his full preparation and cook of the beef stiletto (wrapped in house cured guanciale with Sieglinde potato ravioli, crispy marrow, jus, and parmesan), showing off many little touches and details in making their signature dishes. It was predictably delicious and richly flavourful, more so after witnessing the full process. 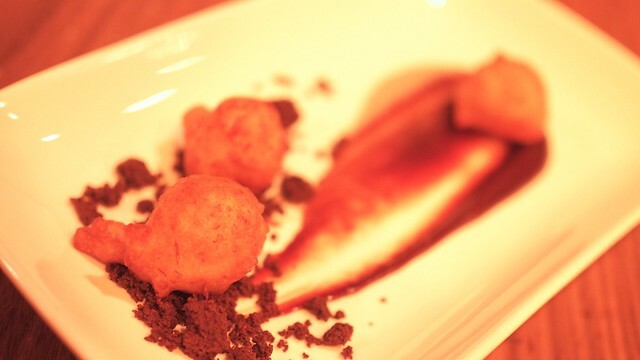 For dessert, we sampled some simple deep fried zeppole pastry dough balls (with banana custard, chocolate pie crust and sauce). Again, it was basic yet filling as it hit our collective sweet spots. 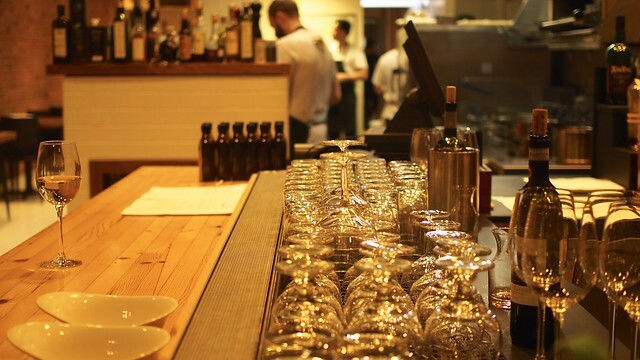 It was an elegant dining experience with a rustic feel and focus on authentic flavours (and wine) in a contemporary Italian setting at the edge of Gastown. There's definitely plenty to nibble and chew on.